Situated under the shadow of the 16th Century tower of the Palazzone, La Faina Cottage is the ideal getaway for couples. Set in the depths of the quintessential Tuscan countryside surrounded by cypresses and olive groves, the cottage is a short amble to the centre of Cortona and a ten minute drive to the train station (which has connections to Florence, Rome, Siena and Perugia). Perfectly placed for "cultural" day trips or exhilerating hikes in the wild hills around, the cottage also has a romantic terrace and pool - designed for lazy meals and long siestas. The English owner has lived in Cortona for 30 years and is happy to help plan itineraries and recommend restaurants and places to visit that are well off the tourist route. 1 Bathroom with bath/shower over, WC and wash basin. 1 sitting room with dining area. A spacious room with sofa, desk and chairs. Kitchen area with sink, four gas burners and small oven, fridge with ice-box. Notes on accommodation: There is a wood stove for heating the rooms. Outside: There is a vine covered terrace with a large table for outside eating. This overlooks the garden. There are 2 sunbeds The private pool (8x4m) is situated on the terrace behind the cottage. Cleaning / Towels / Linen / Maid service: Towels and linen included. The property is cleaned once per week when linen and towels are changed. My wife and I recently returned from a ten day stay in Cortona - all of them spent in this charming little stone cottage surrounded by olive groves half way up the hill to the town. The cottage itself could best be described as 'rustic' so if you're looking for a high spec finish and all mod cons this might not be the place for you. We actually loved it and, apart from a few little things, wouldn't do anything to spoil its charm. The plates and glasses could do with replacing as they've obviously seen better days but that's a small thing and could be done for not much money. The location was ideal as we used it as a base to take day trips around the hilltop towns of Tuscany and Umbria. The lovely little pool was a godsend as the weather was scorching for the first five days or so. Douglas Parish, the owner, is a charming and helpful host being available when you want him and invisible when you don't. Any issues we had were dealt with promptly and efficiently. We'll be back. Just returned from a lovely stay here. The cottage is in a really stunning location, secluded but with beautiful views from the pool and terrace. The cottage is rustic but charming and Douglas the owner was very helpful with any queries and was available for help without being intrusive. 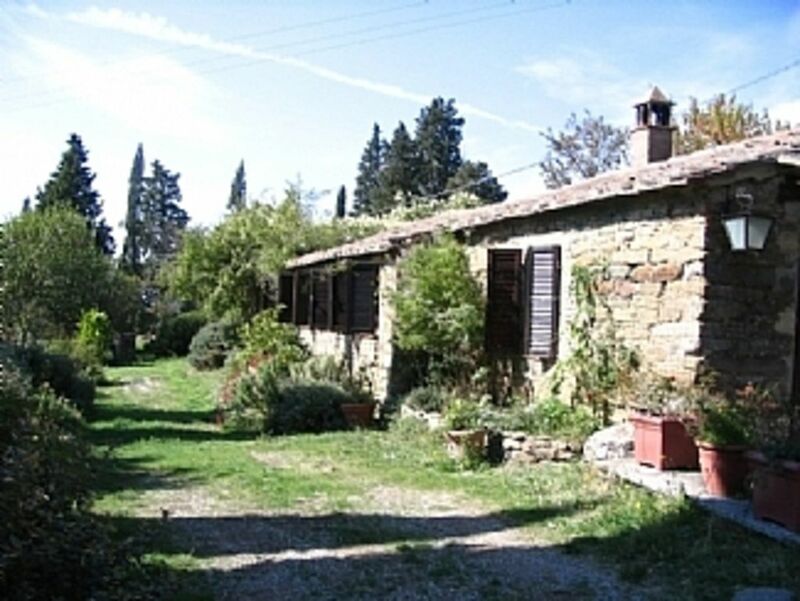 The cottage is in walking distance from Cortona either through the vineyards or along the road. Is a climb either way but not challenging. Only negative comment would be the presence of mosquitos so go prepared for them. If we travelled back to the area we would definitely be happy to stay again. Stunning location, charming and helpful owner, we had a very relaxing holiday. Magnificent views, especially from the pool. Cortona itself is exquisite. Another fabulous stay at La Faina. You're lucky if you've stumbled across this cottage - there are so few options in Tuscany for couples wanting to rent something private, self-contained with your own pool. Perfect location on the hillside with amazing views, but also walking distance into Cortona so you can go out to lunch/dinner and wander back. Also great for visiting either Umbria or Tuscany. But I never tire of some of the sites of Cortona itself - San Niccolo near the top is a hidden gem, the Fra Angelico in the museum Diocesano exquisite, or you could just drink Prosecco sitting outside Bar Sport (highly recommended). Fantastic walking in the hills above Cortona too, with some good hiking trails now well-marked. And the cottage is wonderful - simple, charming, comfortable. I can't recommend it enough, except that I don't want other people to stay there! La Faina is the perfect Tuscan getaway for two. It was everything and more than we could dream of. The cottage is beautiful and homely with a private stunning swimming pool - this is unique as we have never before found a place for two people that has its own pool, and what a pool with the best views in Cortona. Douglas who owns this stunning property is nearby for any help and advice, while never encroaching on your privacy. It is perfectly situated for trips to towns in both Tuscany and Umbria and only a short walk into Cortona, which has everything you will need (cafes, restaurants and food stalls) and is one of the most beautiful towns in the area. This is the best holiday we have ever had in Italy and that is down to La Faina, so we have booked again for next year, as I know I will never match a place like this. La Faina was idyllic - the perfect place for our honeymoon. We had a wonderful 10 days popping into Cortona (where there is lots to see, do and eat! ), visiting some beautiful places in south east Tuscany and idling about the very private cottage and pool. It really was very peaceful and personal. Douglas is also the most lovely host, explaining the history of the area and kindly arranging things for us when our limited knowledge of Italian wasn't quite up to the job! This place is a gem in an already very special part of the world - we would love to come visit again! Florence airport is uhder 1½ hour's and Rome airport C 2 hours driving as is Pisa airport. Car hire is recommended. There are many good restaurants in Cortona, providing a wide variety of Tuscan fare at modest prices. In Cortona there are also general provision stores and butchers. The nearest large supermarket is 15 min away. Internet points and several banks with Atm’s are also available. Cortona boasts a major Etruscan museum and an art gallery with world famous pictures by Cortona painters. The nearest large town Arezzo is a gem and is 25km distant. The major Tuscan towns of Siena 40 min. Montepulciana 35 min. Pienza 1 hour. The Chianti vineyards can be reached in an hour. The great Umbrian towns of Perugia, Assisi and Orvieto are easy to reach and you can see Lake Trasimeno from our olive groves. Cortona is a 30 min walk through our olive groves and along the Parterre which takes you straight to the centre of the town. Booking Notes: To initiate a booking it is necessary to complete a booking form. This is sent to the client by e mail when the client initiates a booking. Conditions of rental are also forwarded at the same time. A deposit of 30% is required when the booking is confirmed. The balance of the rental due is required 2 months prior to occupation. Changeover Day: Bookings run from Saturday to Saturday. Arrival after 4pm. Departure by 10am.